Cegos specialises in face to face and virtual instructor led training, blended training and award winning elearning courses. 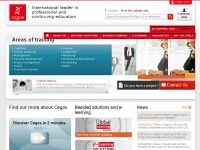 three profiles were found for Cegos.co.uk in social networks. Among other social networks the website is represented in Twitter, GooglePlus and LinkedIn. The web server used by Cegos.co.uk is run by E.I. du Pont de Nemours and Co. and is located in Wilmington, USA. This web server runs 4 other websites, their language is mostly english.